So far, roughly 11.4 million California returns have been filed, more than 90 percent electronically. As for refunds, Tahara said 7.5 million have already been issued, averaging $806 per return. In the last-minute scramble to file by Wednesday’s deadline, many people with questions pick up the phone to call the IRS or FTB. That can be problematic, with wait times up to an hour. That’s why tax agencies are urging people to go online. “So many people call in who don’t really need to talk with someone. A lot of the questions could have been answered on their own using our website,” said Tahara. Many taxpayers, he noted, can use FreeFile programs, free from IRS-approved major tax software companies for those with incomes below $60,000. For higher incomes, the IRS has Free File Fillable forms to quickly file online. For those who enrolled in health care through the Affordable Care Act, there was a new wrinkle in this year’s reporting requirements. For most taxpayers, it’s simply a matter of checking a box on their tax return that they have health coverage. Those who bought insurance through Covered California or the federal marketplace must include a 1095A form, which was sent to them. But there have been errors on some forms. Last month, the IRS offered some relief, noting that affected taxpayers do not need to file an amended return. “This is true even if additional taxes would be owed based on the new information,” the IRS stated on March 20. But, in either case, you still have to pay what you owe. The extension is only for filing the tax paperwork, not for skipping the payment. “If you know you will owe, you want to send in something, just to avoid a penalty,” said FTB’s Tahara. To get a quick estimate of what you owe, he recommends using the online tax calculator on the FTB’s website. Franchise Tax Board: Answers to basic tax questions are at (800) 852-5711, weekdays from 7 a.m. to 5 p.m. But note: Wait times can be up to an hour or more. Faster service is through Live Chat online at ftb.ca.gov. IRS: Fastest service is at www.irs.gov, including the “Interactive Tax Assistant” and “Tax Trails” feature. Or call (800) 829-1040, but wait times can be lengthy. The Sacramento IRS office at 4330 Watt Ave. is open daily from 8:30 a.m. to 4:30 p.m. Staffers can answer basic questions, take payments or accept a tax return. They do not do tax preparation. The Sacramento office also has a “self-assistance” computer kiosk with an IRS employee to assist in navigating the IRS website. Free tax-filing help: To find community locations for free tax-preparation help by ZIP code, go to www.irs.gov or use the AARP’s locator guide. Or call the IRS at (800) 906-9887 or AARP at (888) 227-7669. Most locations offer Volunteer Income Tax Assistance (VITA) and Tax Counseling for the Elderly (TCE) programs. You’ll need to bring ID, last year’s tax return, W-2s and other income statements. Boston Market: Buy one meal, get a second for free. Cinnabon: Free bite-sized cupcakes from 6 to 8 p.m. in mall locations. 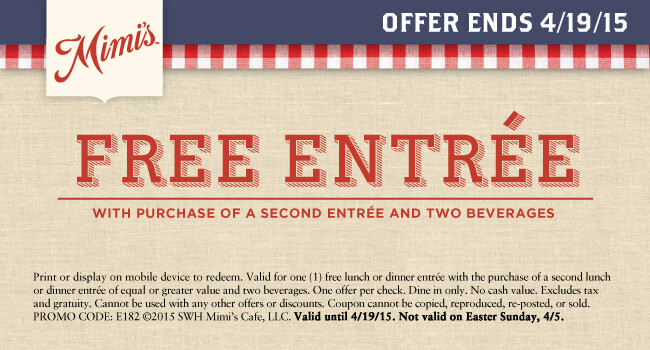 Hard Rock Café: Free burger, sandwich or salad to anyone who stands up and sings in front of fellow diners, from 5 to 7 p.m.
Mimi’s Cafe: Buy one lunch or dinner entree, get second one free with coupon. Office Depot: Free shredding for up to 2 lbs. of paper with officedepot.com coupon. P.F. Chang’s: A 15 percent discount on food, dine-in or take out.